This is a follow-up article to the “What to do about the Siemens Product Lifecycle Management Software Inc. v. Does case (TX)” article I wrote last week. I did a bit more digging into the Siemens Product Lifecycle Management Software Inc. v. Does 1-100 (Case No. 4:16-cv-01422) lawsuit in the U.S. District Court for the Southern District of Texas, and I learned more about their software, and more about where some of the John Doe defendants are coming from. What I also learned was that this is not the first time they have sued defendants for copyright infringement. *UPDATE* As of 1/2019, Siemens PLM has filed their 6th wave of lawsuits, this one entitled Siemens Product Lifecycle Management Software Inc. v. Does 1-150 (Case No. 4:19-cv-00129), also filed in the Texas Southern District Court. The Siemens Product Lifecycle Management (“PLM”) software being sued over is known as the Siemens NX software. 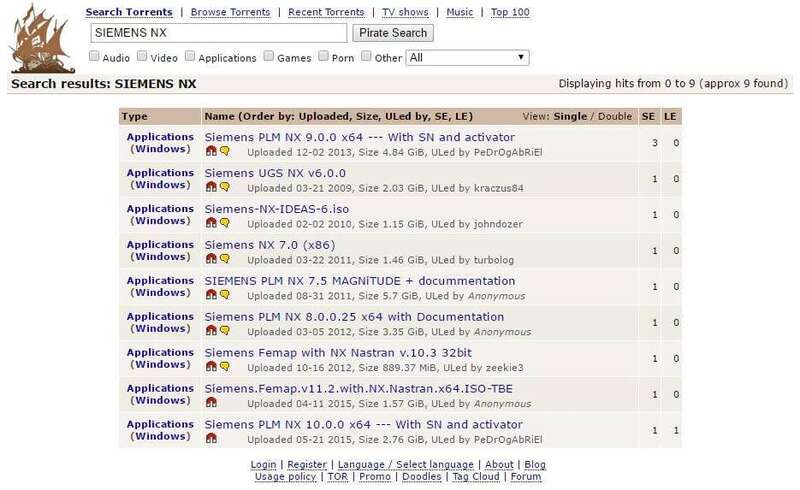 The Pirate Bay shows 9 torrent files for “Siemens NX” software (below). Surprisingly, for version 9, there are only 3 seeders (uploaders). For all others, there is only one seeder. For a program that takes on average 1GB-5.7GB to download, a download like this could take forever to complete. Looking at version 10 (the current stable release; version 11.2 is probably a fake), there is one seeder (uploader) and one leecher (downloader). See attached. As dry as this post may be, the point is that my suspicions were correct — even though the bittorrent file provides a serial number (probably a valid, but likely an OLD registration code), and even though there is an “activator” which modifies or “cracks” the pirated file to allow the software to accept the old serial number [it likely does this by blocking the “authentication” feature when the software checks with the server to verify the registration key], the software looks to the user as if he has successfully registered the software. However, through the CASUAL USE of the software, the activator software is likely not persistent, which means that after the software is registered using the old key, it restores the software’s executable (.exe) file to its original state. Then, when using the software, it connects to Siemens’ servers for whatever purpose (to download an update, to check for new features, etc. ), and this is how their copyright enforcement / IT department can identify the IP address of the individual using a pirated copy of the software. In sum, what this means is that Robert Riddle (more recently, attorneys Andrew Bluebond, and now James Quail) and the Siemens copyright holder likely knows how long the software has been in use, and which IP addresses have been using an old or invalid serial number. This will likely be a consideration when discussing the matter with the plaintiff attorneys on behalf of my clients. *2019 UPDATE* Usually as the Siemens PLM cases advance from one wave to the next, I update these articles with the most recent case number and “motion to quash” due date given to the subscriber by the ISP. However, the 2019 case is too new, and I do not yet have an update for the Siemens PLM v. Does 1-150 (Case No. 4:19-cv-00129) 1/2019 filed case. Thus, please read what I have written below and apply it to the subpoena you received from your ISP. *2018 UPDATE* What all this means for you — 1) October 5th, 2018 appears to be the date that Charter Communications will be ordered to hand over the names and addresses of the 107 accused John Doe defendants, so pay attention to the lifecycle of your lawsuit, and when you are no longer anonymous. Also be sure to read about motions to quash so that you will understand whether you will want to stop your ISP from handing over your ISP, as most defendants in this most recent case do not appear to live in Texas. 2) If you have been using the software, they likely know more details than you would like as to what you have been doing with it. 3) Speak to an attorney (me, or anyone else) about what options you have to get out of this, whether you were the downloader, the purchaser (of a pirated copy of the software), or whether you have absolutely no idea why you have been implicated as being one of the John Doe defendants in this case. How an attorney should handle a Siemens PLM Software, Inc. lawsuit, on 1/11/2017. Siemens PLM NX-based lawsuits – converting accused engineers into loyal customers, on 1/9/2017. Software Developers are now tracking piracy through the USE of downloaded software, on 9/9/2016. 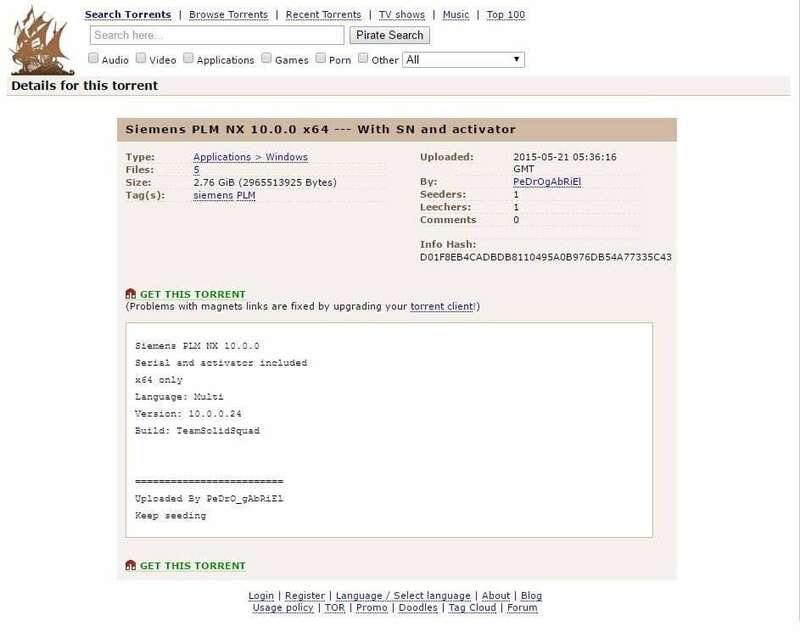 Siemens Software Case IS a Bittorrent Case, on 6/20/2016. What to do about the Siemens Product Lifecycle Management Software Inc. v. Does case (TX), on 1/16/2016.